ANOMALY - An irregular or unusual event which does not fit a standard rule or law. An anomaly is something which cannot be explained by currently accepted scientific theories. Anything weird, abnormal, strange, odd, or difficult to classify is considered an anomaly. APPARITION - A ghost/spirit like image of a person, thing or object shows up somewhere that seems virtually impossible or that you know with absolute certainty wasn't there when you looked earlier. The spirit world can and does manipulate physical objects, often transporting them through space and seemingly impenetrable barriors so that they appear in places we swear they couldn't possibly be. APPORT/APPORTATION - When an object shows up somewhere that seems virtually impossible or that now with absolute certainty wasn't there when you looked earlier. The spirit world can and does manipulate physical objects often transporting them through space and seemingly impenetrable barriors so that they appear in places we swear they couldn't possibly be. ASTRAL PROJECTION - Astral projection is the simple and surprisingly common process of the spirit taking temporary breaks from the body that houses it. The break might be momentary and the spirit might stay in close proximity to the body, for the shear exercise of it. Or it might be a more distant experience in which the spirit projects itself to some specific location, which in the dimension of the spirit realm takes no longer than the blink of an eye. AUTOMATIC WRITING - Is allowing a spirit/ghost to take over your body and work through you to communicate in the form of writing. To freely channel your higher self or another soul's words, music, or art without the interruptive interference of the mind. BANISHING - Formal ceremonial procedure effected visible presence or influence out of an area. BANSHEE - The ancient legend of the banshee is centered in the mists of Ireland. The word "banshee" originates from a Celtic word that means "woman of the fairy" and by varying accounts, banshees appear in the form of tiny bent old hags with white hair or towering slender young women with flowing white hair. What banshees are most noted for is their piercing unearthly wail that is said to break glass and the wail serves as a warning of an impending death in a house. BI-LOCATION - It's simply an ability, common to the residents of the spirit world to be literally in two places at once. BLEED-THROUGH - An event in which two separate times or dimension's come together with such intense spiritual force that for a brief time they meet, blend and become one. CELL MEMORY - Is the total body of knowleddge our spiritminds have gathered during all our past lifes, infused and reacted to by every cell in the body the moment we "take up residence " in the fetus. There are some theories today that have the belief that through hypnosis these cell memories can be brought forth to resolve countless health problems, phobias and chronic pains from past lifes brought into the present life. CHANNEL/CHANNELING - A channel is a medium (one who is able to communicate with the spirit world) who receives spirit communication by going into an altered state of consciousness, usually through meditation or a trance and allows the spirit to literally speak through them. NOT to be done by someone untrained in this area. CLAIRAUDIENCE - Being able to hear voices, astral music or discarnate beings. CLAIROLEOFACTOR - To have an extraordinary sense of smell, as if you could smell flowers before they bloom or smell trouble before it occurs or death before it happens. CLAIRSENTIENCE -The ability to clearly feel yours and/or another's emotions and sensations. CLAIRVOYANCE - Is the ability to see beings, objects or information that originate from some other dimension, whether they're spirits from the Other Side or objects from the past that no longer exist in the present or visions of future events. Clairvoyants have what's sometimes called the "second sight" which allows their eyes to perceive a wider range of input and frequencies than normal. COLD SPOT - In ghost hunting a cold spot is a supposed area of localized coldness or sudden decrease in ambient temperature thought to be associated with paranormal activity. DEJA VU - There are two kinds of deja vu. The First occurs when you visit a certain house, city, road, foreign country or some place you have never been before and suddenly realize it seems very familiar, sometimes so familier you even know you're way around. The Second kind of deja vu is so common, subtle and seemingly trival that we rarely give it a passing thought. It consists of a moment in which every detail, from what you're doing to whom you're doing it with to your surroundings to you're weating and thinking and feeling is so familiar that you're absolutely sure you're reliving an exact duplicate or a moment from your past. DEMON - Believed to be fallen angels who were cast out of heaven by God during the rebellion lead by Lucifer. An entity that has never walked the Earth. Evil spirit that is believe to have the power to possess and change forms to suit their needs. Demons can be in many places at one single time. DEMONOLOGIST - A person usually a member of the clergy who studies and catalogs demons. EARTHBOUND - Is another name for a ghost/spirit that has left its physical body but is unable or unwilling to leave the phsyical realm. ECTOPLASM - Is thought to be the tangible supernatural substance/residue that is supposed to exude from the body of a medium during a spiritualistic trance to lend energy to the spirit/ghost to help it fully manifest. EMF/ELECTRO MAGNETIC FIELD - lectromagnetic fields are present everywhere in our environment but are invisible to the human eye. An electromagnetic field is one that contains both magnetic and electrical properties and effects the behavior of the charged objects within the field. Theory in the paranormal field is that emf's lends energy to spirits /ghosts. EMPATH - Form of telepathy wherein the empath appears to be aware of the emotional state of a distant person. An empath may also be able to "broadcast" emotions to others. As an emplath you are affected by other people's energies, and have the ability to intuitively feel and perceive others. Your life is unconsciously influenced by others' desires, thoughts, pain and moods. You are highly sensitive and can sometimes be overwhelmed or even drained by other's energies. Feeling the energies of others is not limited to the living but empaths can feel the energies of the spirit world as well. ETHERIC ENERGY - A type of very fine matter or substance that is all around us, and which permeates all physical matter. It is the same as that which is called chi, qi, vital force, prana and other names in various languages. It is a wave-and-particle type of energy, in terms of modern physics. It is a range of frequencies of energy, and not just a single frequency of energy. This energy activates and gives life to all beings and even all physical matter in the physical world. It must be present or life ceases. It cannot usually be seen, but it is needed to support all the life forms on the planet, and everything else in our physical universe. EXORCISM - Is the act of driving/casting out a demon or other supernatural entity using the Roman Ritual as prescribed by the Catholic Church. In Catholic Christianity, exorcisms are performed in the name of Jesus Christ. A distinction is made between a formal exorcism, which can only be conducted by a priest during a baptism or with the permission of a Bishop, and "prayers of deliverance" which can be said by anyone. EXTRATERRESTRIAL - Originating, located, existing or occuring outside Earth or it's atmosphere. Familiar - A lesser demon given bey a demon that has the ability to assume the shapes of small animals such as a cat, rodent, etc.. GANZFIELD METHOD - A state of mild sensory deprivation, characterized by the presentation of homogenous sensory fields. Thus, a person in Ganzfeld will have diffusive plastic hemispheres and googles over their eyes while in a dimly red-lit room, be listening to white noise through headphones, and be seated in a comfortable, semi-reclined chair. Its use in parapsychology is based on a noise-reduction model. GHOST - An apparition of a dead person that is believed to appear or become manifest to the living. HAUNTING - Cohabitating with one or more earthbound spirits. INFUSED KNOWLEDGE - Is information that is directly transferred form one mind to another with no involvement at all from the five physical senses. Unlike other mind to mind communication like telepathy the reciever is given information he/she had no knowledge of before without having any conscious awareness of where it came from. IMPRINT - An imprint is an intensely concentrated pocket of energy at a site at which some extremely dramatic event or series of events has taken place with such profound inpact that the images and emotions from those events become a part of the land and atmosphere at the site itself. Not only do those images and emotions-grief, reverence, rage, terror and joy for example becone self-sustaining over the years, but everyone who experiences the powerful effect of the imprinted images and emotions and strongly reacts also lends even more energy to the imprint and helps perpetuate it. INHUMAN SPIRIT - They manifest as a genderless, half-human half-animal being, an inhuman spirit is an immortal being that was never human. INTELLIGENT HAUNTING - An incident in which a ghost/spirit knows and interacts with the living. KARMA - It's derived from a word meaning "Balance of Experience." As some faiths believe in what is said in the bible "What ye sow, so shall ye reap" or in more contemporary words "You get back what you give". KII METER - A handheld device that measures EMF's in an area. Within the paranormal field most ghost hunters use this devise to communicate with or detect ghost/spirits. This device has five lights and it is believed when a spirit is near the device it will cause spikes by lighting up the lights. Some believe it all depends on the energy level of the spirit as to how many lights will or can be lit. KIRLIAN PHOTOGRAPHY - Is a method of capturing on film the aura or enegy pattern that surround living things. MEDIUM - A person who has the expanded range of frequency perceptions allowing them to be able to see, hear and communicate with ghost/spirits. Some believe it is "God given talent" and you have those that believe it is a farse. NECROMANCY- The practice of communicating with the dead, especially in order to predict the future. NIGHTSHOT - Technology that enables vision at night, by amplification of low light to create visible images or by detection of infrared wavelengths. Today most cameras/video cameras have the nightshot feature. OUIJA BOARD - Consists of a board with the letters of the alphabet, numbers and other symbols. A planchette moves around the board theoretically spelling out words and messages from the spirit world. Belief by some is that by using this board you are also openning a portal and the chance of an evil or demonic entity coming through the portal is a very real possiblility. OUT-OF-BODY EXPERIENCE- a sensation of being outside one's own body described as typically of floating and being able to observe oneself from a distance. Claims are made this happens sometimes when someone has a near death experience. PALMISTRY - Is the interpretation of a person's past , present and future through the study of the lines, mounts, skin patterns and other markings of the hands. Both hands should be read at the same time as there is a chance markings vary from hand to hand. The markings that are used to read palms can and will change on a daily bases according to mood and what is happening in your life at the time of a reading. PARAPSYCHOLOGY - Is a field of study concerned with the investigation of paranormal and psychic phenomena. Parapsychologists study telepathy, precognition, clairvoyance, psychokinesis, near-death experiences, reincarnation, apparitional experiences, and other paranormal claims. PAST LIFE RECALL - To remember or have mental flashes about living in another life time or century. PENDULUM--Is a weight/crystal/stone suspended from a pivot so that it can swing freely. The base that the pivot sits on can be marked with a "yes" on one side and a "no" on the other side. Within the paranormal field a pendulum is used to communicate with the spirits by answering "yes" or "no". A pendulum can also be used to find locations on a map and there have even been cases of psychics trapping evil spirits within the pendulum stone itself. PENTAGRAM - A five pointed star with a circle around it. These can either be pointing up or down, depending on religion. An upright star is used mainly by wicca, but it was also used as a christian symbol, in christianity its meaning is of the five scars of Jesus. An inverted star is used in Satanism, it represents pointing toward Hell. PHANTASM - Is just another name/word for a spirit that has not crossed over yet. POLTERGEIST - A ghost or other supernatural being supposedly responsible for physical disturbances such as loud noices and objects thrown around. A general term applied to a variety of a site or sometimes person's specific physical phenomena. These can include temperature variations, anomalous sounds, and movement of physical objects. The word 'poltergeist' literally means 'noisy spirit' and was coined back when such phenomena were thought to be due to the presence of some sort of mischievous entity. Currently, poltergeist phenomena are usually considered to be related either to unusual physical conditions at the affected site, or to be related to psychokinesis. Reports suggest that many poltergeist focus on an individual under some form of emotional stress. POSSESSION - A term for the belief that animals, demons, extraterrestrials, gods or spirits can take control of a human body. The concept of spirit possession exists in many religions. Depending on the cultural context in which is found, possession may be considered voluntary or involuntary and may be considered to have beneficial (channeling) or detrimental (demonic) effects to the host. Within possession cults, the belief that one es possessed by spirits is more common among women than men. PRECOGNITION - Pre-knowing; where nondeductible information about a future event is acquired. PRECOGNITIVE DREAMS - To have dreams of events or incidents before they happen. PREDICTION - To be able to predict future events before they occur. PSI--Supposed parapsychological or psychic faculties or phenomena. A general term for parapsychological phenomena that includes informational RV (remote viewing), ESP (extrasensory perception) and energetic PK (psychokenesis) effects. PYSCHIC - Is a person who claims to use extrasensory perception (ESP) and mental telepathy to identify information hidden from the normal senses. PSYCHIC ATTACKS - Rather than attacking/assaulting the body, psychic attacks target our minds, our self confidence, our hope, our sense of power and even our faith in God's unconditional love for us. They diminish us, they seperate us from joy, happiness, humor and enthusiam. They drain us of enough energy that it's hard to even try to pull ourselves out of it. Also known as "psychic warfare." PSYCHOKINESIS - The supposed ability to move objects by mental effort alone with no scientific explainable force or explanation. PSYCHOMETRY - Is the ability to sense and interpret energy that has been absorbed by inanimate objects. Psychics and mediums read the energy by holding or placing their hand on the object to feel what kind of energy it possesses and to get information about the object such as it's creator, owner or it's history. QUICKENING - Simply means "To come to life" or in the bigger more accurate picture "To have the spirit enter and activate the body." RAPPORT -This is a very rare occurance. It is when a spirit that has crossed over comes back to visit and upon arrival into our dimension a loud sound like a sonic boom is heard. Most times when a spirit comes to visit this does not happen. REINCARNATION - Is the belief the human spirit/soul survives the death of the body and returns to recurring lifetimes in a variet of chosen circumstances and bodies. REMOTE VIEWING (RV) - Is the practice of seeking impressions about a distant or unseen target using subjective means, in particular, extrasensory perception (ESP) or "sensing with mind." RESIDUAL HAUNTING - Is a psychic imprint of an incident that is repeatedly played out and witnessed by someone living. The ghost/spirit seem unaware of their observers. SCRYING - Is a form of divination/fortune telling practiced by looking into a crystal ball, vision mirror or other translucent material with the belief that things such as spiritual visions can be seen. Today "Vision Mirrors" are very common in the teachings of Parapsychology. SHADOW PEOPLE - Often appear as white, various shades of gray or totally black and they are usually seen through the viewer's peripheral vision for a split second. Shadow people are usually seen as a mass that has human form but do not have any discernable facial features. Today there is a lot of controversy on whether shadow people are considered malevolent supernatural entities or just spirits who do not have the energy to fully manifest. Some texts claim they are a type of demonic entity that are most typically found inside of homes that looks like a featureless black mist that animals are especially sensitive to. SPRITE - Usually associated with fairies and elf like creatures. Claims are they have magical powers. SUBLIMINAL PERCEPTION - Sensory impressions below the threshold of conscious awareness. SYNCHRONICITY - Meaningful coincidences that often are mediated by subconscious psi activity. Our intuitive/psi faculty nudges our paths into meaningful intersections in times of need. TELEKINESIS , PSYCHOKINESIS, LEVITATION - The ability to move an object or your body without physical means. TELEPATHY - To know what other's are thinking as if to hear the thoughts in your head. Being able to transfer thoughts from one person to another and to recieve thoughts from another. THIRD EYE - Is centered between your eyes and slightly above them. It is also called the Inner Eye. It is the ability to know the unknown. The pineal glad is believed by some to be the source of the spiritual insight. TRANCE - Is a condition in which there is an actual, dramatic and measureable drop in the body's vital signs and an equally measureable decrease in mental activity and a complete temporary halt to all voluntary movement as typically induced by hypnosis or entered by a medium. TULPA - A being that originate in the mind and then through intense belief and visualization become an actual physical reality. It's a case of one mind or several minds creating a very real physical living being that eventually takes on a life of it's own, gathering strength as more and more people believe in its existence and usually becoming harder to get rid of than it was to create it in the first place. V OODOO - A black religious cult practiced in the Caribbean and the southern US, combining elements of Roman Catholic ritual with traditional African magical and religious rites, and characterized by spells, charms, herbs and spirit possession etc.. At the heart of voodoo lies a belief in God. Practitioners also believe we are all parts of the same One, in other words, any action we take toward anyone or anything around us--kind or cruel-- is an action we take towards ourselves. They also revere their ancestors whose spirits they believe are still alive and present among them and pay frequent ceremonial homage through music and dance to their connection to the spirit world and great divine. WHITE LIGHT OF PROTECTION - The white light put most simply is God's aura. It's infinite love, wisdom, compassion and infinite power contained in a brilliant fathomless glow. It's the Light we can mentally surround ourselves to protect ourselves against negative energies. 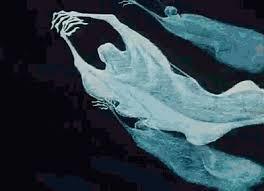 WRAITH - Is a Scot's word for "ghost", "spectre" or "apparition". They are especially seen after a persons death.